Solitaire Games: Goodsol Newsletter #219 - Happy Holidays! Goodsol Newsletter #219 - Happy Holidays! Pretty Good Solitaire (Windows only) is available from Amazon. The Amazon packaging and ordering system makes giving gifts easy. 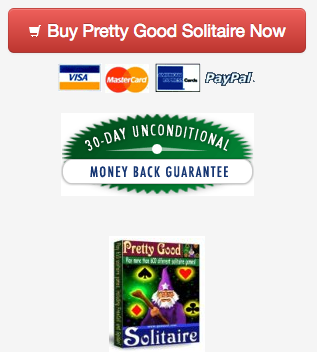 To see Pretty Good Solitaire on Amazon, just go to http://www.goodsol.com/amazon.html or go to Amazon.com and search for "pretty good solitaire". It is currently eligible for Amazon Prime, which means free shipping in the USA, but only while Amazon has it in stock in their warehouse. If you want get it before Christmas, you'll need to order quickly to ship before Christmas. All of our Windows games at http://www.goodsol.com/wingames.html and all of our Mac games at http://www.goodsol.com/macgames.html are 20% off if you use the coupon code HOLIDAY on the order between now and the end of Tuesday, December 23rd. In addition, the iPad version of Pretty Good Solitaire is also 20% off. See http://www.goodsol.com/ipad . -- A new version of Pretty Good Solitaire for Windows with new games will be coming early in the year. -- A new update of Pretty Good Solitaire Mac Edition and iPad version adding more games from the Windows version. 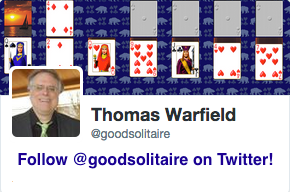 -- In July the 20th anniversary version of Pretty Good Solitaire. This game is at Algerian Patience.